Crisp silhouettes, bold palettes, and decoupage-like layers define the artwork of Rex Ray, whether it’s a gallery piece on canvas or an album cover for David Bowie. His creations lie somewhere between handmade craft and digital graphic design, and impart a retro-modern aesthetic à la Alexander Girard that speaks to architecture and design, but also the masses. It’s only natural that B+N Industries, a wall panel and display manufacturer, would tap him for its first artist collaboration. 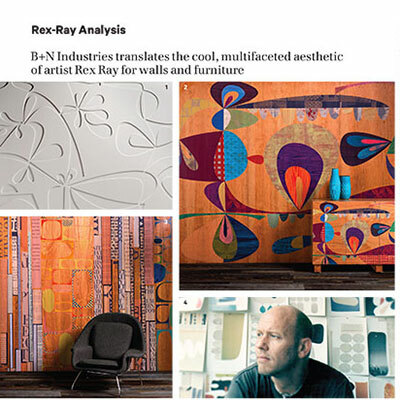 Ray’s art was customized for the manufacturer’s Iconic Panels and Infused Veneer lines, as well as a furniture collection. Iconic Panels depict the artist’s signature shapely compositions in carved wood reliefs finished with formed laminate. Meanwhile, the Infused Veneers, measuring 48 by 96 inches, sport groovy Ellipses and Waves, stick-and-stone–like type and ovals, and bridge-evoking Arches and Bumps. Logically, B+N incorporated the veneers into furniture, resulting in a plinth table, nesting tables, credenzas, cubes, and a bench. The furniture and veneers capture the essence of the artist’s collages that blur the boundaries between computer-generated and handcrafted, fine art and graphic design, and flat and dimensional.